Today was my first trip of the year up the steps of Cardiac Hill in Killarney. For those not familiar with this trail, it is a not-so-gentle ascent up the slopes of Torc Mountain, just a few kilometres outside of Killarney town. The steep rise up through hundreds of steps brings great rewards to the walker or trail runner with panoramic vistas throughout the trail. If you need a break en route, you can take your pick of the great views of the Lakes of Killarney, McGillycuddy Reeks and the rest of Killarney National Park. There are a number of different options for ascending Torc and this particular trail will not bring you to the top if it’s a summit route you’re after. However, it is a relatively short route that will give you a great return on your investment up those famous steps. Warning! the steps of Cardiac Hill are not for the faint hearted and will have you huffing and puffing in no time so bear that in mind before you set out. My favourite approach to this trail is to start from the small car park on the N71 (see map) just beyond the main car park at Torc mountain. Cross the road and follow the trail to the right. Continue along this rolling pathway for about 5 minutes and watch out for the sign on the left which marks the start of the steps. Beware of some distractions like this on the way…. you may miss the sign! An alternative starting point at the Dinis Car Park will bring you to the steps earlier if you want to get straight to it! For those more interested in going for a run on a flatter route, check out some of the best 5k runs of Killarney National Park. So off we go up the steps. The talking will stop pretty quickly after this! It’s a slow steady ascent but there’s a lovely character to the steps that makes it an interesting climb rather than a tedious slog. Triggs was enjoying the freedom and the fragrances as he scampered up the steps ahead of me. His frenzied sniffing is usually a tell-tale sign that deer are nearby so I was on high alert for spotting a red deer or two. Some more evidence of deer activity on many of the trees which the stags use to scratch their itchy antler head gear. Soon after, the steps are joined by a rope and pole banister for the rest of the journey. Well weathered at this stage, the rope melts into the trail and is a welcome addition at certain junctions. Once the steps are over, the trail levels out nicely and you now begin to traverse the northern face of Torc. The lakes and the town to your left, the steep slopes to the summit to your right. Peppered along the way are some stunning lookout posts and even a nice shelter if needed. The steps now lead you gently back down through the forest giving the knees a new set of instructions to follow for a change. Before long, you emerge into a wider forest trail and leave the steps behind you. At this point, you will reach a junction where you can head to Torc waterfall and descend to the main car park or you can take a left and descend via a gravel path to where we parked at the start. If you do descend via the waterfall, you can still return to your start point but it will add a little bit to your journey. Today, I was keen to get back so Triggs and I went for the more direct route back down. 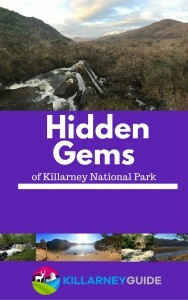 If you want to try out some easier walks around Killarney (without the hundreds of ascending steps…. ), check out 5 easy walks under 5km. Well worth the huff and puff, Cardiac Hill pays you back in spades for the sweaty investment at the start of the trail. You get a view like this just after you finish the steps. Nice! thanks for the comment Joan. Yes it is a super walk and the views are worth the effort!! I’m from SA but experienced this part of Ireland this summer. Beautiful. Want to book other trips to this area now. Will use https://www.campsited.com/ to do so. Saw them on your fb page. Hi, hoping someone can help! We did this trail in September 2015 (visiting from Canada) and not realizing how challenging it was, nearly died! Ok, not quite died, but it was a challenge. We’re returning in 2017 and I’m trying to get my husband to take more interest in keeping fit and Cardiac Hill is our goal – to climb without dying. He wants to know how many “steps” there are. Could someone who does this regularly try to count? Would greatly appreciate it. I’m working on 600 steps to do Michael Skellig (he won’t join me) but need something for him to work towards. Enjoy your trip this year! Thanks Donal! Now we have the goal! Looking forward to another great stay in Killarney! Thanks for reading and thanks even more for pointing out the error. It has now been updated.